This topic provides a description of the controls on the Set Zoom Factor dialog. The Zoom feature lets you enlarge or reduce the view of the opened image. To set custom Zoom Factor for the opened image click Zoom>Custom... menu item from the View menu. Zoom changes only the display size within the working area, not the image size! Press Apply button to set Zoom Factor for the opened image. 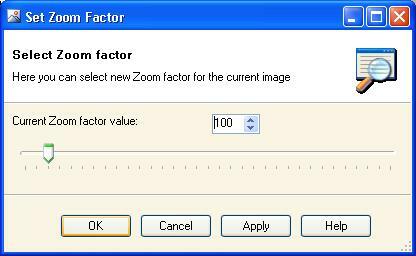 Press OK button to set Zoom Factor for the opened image and close dialog.